Finding the right screen recorder can be tricky, particularly due to the sheer number of options that are available nowadays. Needless to say some screen recorders stand out more than others however, and two that you’ve probably heard mentioned a number of times in the past are Movavi Screen Capture Studio and CamStudio. Although CamStudio has a clean and simple user interface, it is a bit dated in appearance. On the other hand Movavi Screen Capture Studio is easy to use and intuitive, but also looks a lot slicker at the same time. While CamStudio has all the essential features that you need to record videos from your screen, Movavi Screen Capture Studio trumps it on several fronts. It lets you schedule a date and time to automatically start recording, can capture keystrokes, and also has the ability to record video and audio streams from different sources as standalone tracks – all of which CamStudio lacks. Within Movavi Screen Capture Studio is a comprehensive video editor capable of cutting and joining video segments, improving the video quality, applying special effects, adding audio tracks, inserting customizable text, and much more. In contrast CamStudio has no editing capabilities whatsoever. With CamStudio you will be limited to saving your video in AVI or SWF format and with minimal adjustments. That is not the case with Movavi Screen Capture Studio, which can save videos in any popular format such as MP4, WMV, and so on and also has adjustable settings for resolution and bitrate that will let you compress your videos. As you can see Movavi Screen Capture Studio betters CamStudio in various ways – which clearly illustrates their difference. Essentially CamStudio is freeware, and designed to offer a basic and no-frills screen recorder whereas Movavi Screen Capture Studio costs $49.95 but includes a more robust screen recorder coupled with a powerful video editor. 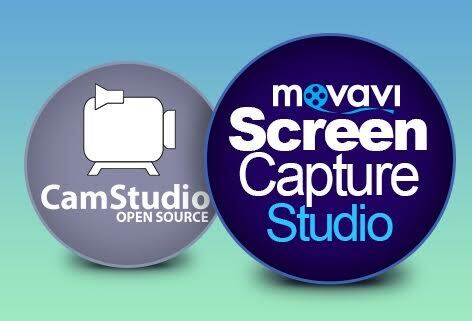 Essentially if you want a screen recorder that is versatile and can help you to record professional-looking videos then Movavi Screen Capture Studio is clearly the better option.